Mother In China Killed Her Children And Herself, And Bloggers Ask If Her Poverty Was To Blame : Goats and Soda They're wondering about the impact of the family's poverty on the tragic turn of events — and whether the government does enough to help the impoverished. Gansu province, where the family lived, is one of China's poorest. Above, rural residents do their washing. The story is as tragic as it is horrifying. An impoverished young mother from China's Gansu province killed her four young children and herself. Her husband later killed himself as well. The murder-suicide case has gone viral on Chinese social media, as commenters wonder if the family's poverty contributed to the turn of events. On Aug. 26, neighbors say Yang Gailan fed her four children, all under the age of 7, and took them with her to tend to the sheep. They never came back. The 28-year-old mother poisoned each child with pesticide and attacked them with an ax. The children's grandmother, Yang Lanfang, who found Yang and her children, barely alive, described to Chinese journalists how she was laughing ever so slightly. The mother-in-law reported that Yang told her: "I can no longer take care of you. You go your way, and I will go mine." Yang Keying, Yang Gailan's husband and the father of the four children, worked as a migrant worker and was away for long stretches of time. The money he sent home — about $500 a year — was never enough. She struggled to care for both her four children and her husband's parents in their dirt house in Gansu's remote Agu Shan Village. 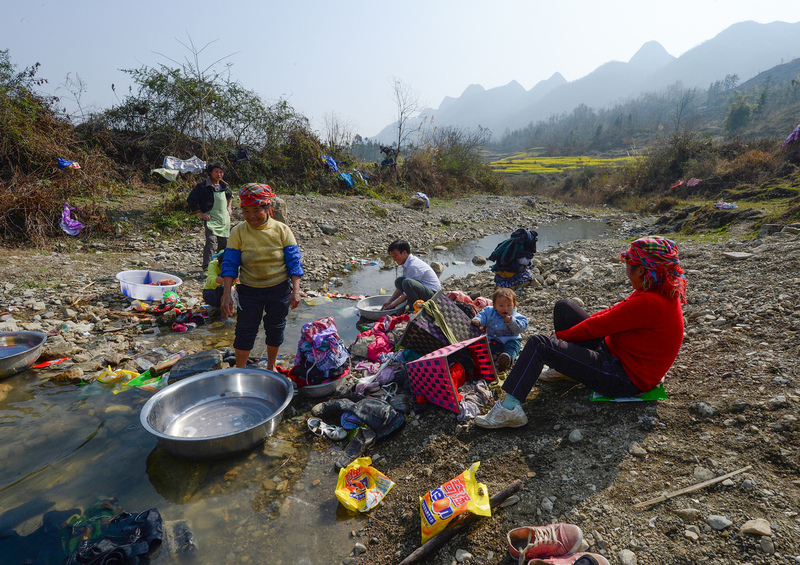 "They were the poorest family on this entire stretch of road," one villager told Chinese reporters. Yang Keying was found dead on Sept. 3, after poisoning himself with pesticide. Ingesting pesticide is a common tool for suicide in a country where the private sale of guns is forbidden and knives are heavily regulated. By contrast, pesticide is cheap and easily accessible. China has numerous policies aimed at alleviating rural poverty, but each of them failed the Yang family. The most prominent is the minimum livelihood guarantee policy or dibao, as it is commonly called, which provides families in poverty a subsidy to bring them up to a previously defined minimum standard of living. The Yang family should have been recipients. But neighbors said the Yang's assistance was abruptly canceled last year because they owned three cows — two for tilling fields and a calf. The Yang family also apparently could not pay all their required taxes, citing their financial situation, meaning their four children had not received their hukou, or household registration. The hukou is required to receive important social benefits like education and health care. Their eldest daughter, who was 7, should have been in school according to compulsory education laws but could not register without a hukou. News of the tragedy exploded on social media and national news platforms, sparking conversations about inequality. In October, China's leader Xi Jinping pledged to bring the 70 million citizens currently living below the poverty line out of poverty, but many bloggers said the measures were too little and too late. "The country should spend several years moving the more scattered impoverished communities in the mountains to more concentrated areas to prevent these kinds of tragedies from happening," wrote one user on Weibo, a popular Chinese microblogging platform. China's fast economic growth has spawned one of the most noticeable inequality gaps in the world. A 2016 report by Peking University found that the poorest 25 percent of households own just 1 percent of the country's wealth, while the top 1 percent own a third. In 2012, China's Gini coefficient — a widely cited standard for measuring inequality — was 0.49. Anything above 0.40 reflects severe income inequality, according to the World Bank, which compiles the standard. The U.S. had a Gini coefficient of 0.41 that year. Gansu, where the family lived, is one of China's poorest provinces. The tragedy in Gansu also illuminates the economic rift between rural and urban areas in China. As more rural families leave to seek their fortunes in China's cities, the impact has been clearly felt among the communities left behind. Nearly one-fifth of China's children are considered "left behind," with one or two parents working far away from their families. According to a survey of 2,130 such children, they suffer high rates of bodily injury, depression, delinquency and even death. "There are too many families like this in Gansu, and no one cares," wrote one user. "Unless they die, the government doesn't even know they exist!" Others pointed out the burdens faced by rural women and counseled understanding and compassion for the mother. "We can never understand the life of a woman upon whose shoulders was the burden of taking care of an entire family of both the old and young," wrote one blogger. One user wrote, "Only people who have lived in poverty before can understand helplessness, hopelessness and the taste of heartbreak." The widely shared story seems to have touched a nerve among government officials. Several longer news articles about the case were taken down starting on Sept. 12. Numerous personal blogs and local media articles were also removed — adding to the indignation of online commenters and bloggers. "Why is it when we write about our fellow citizens, we feel the invisible hand of intervention?" wrote one blogger.